Sensei, which is Japanese for 'teacher', helps automate a common heart procedure. Patients at St Mary's NHS Trust in London may soon benefit from the skills a robotic surgeon brings to the table next they need treatment for a common heart condition. The Paddington-based hospital has recently received a robotic operating system that almost completely automates a procedure known as catheter ablation, in which a wire-tethered catheter must be guided through blood vessels from an incision in the patient's groin to the heart. 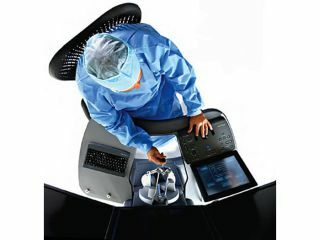 The Sensei machine - provided by Hansen Medical in California - controls the safe path and positioning of the probe as a surgeon guides it by joystick on its long journey. Once safely in position, the probe delivers electrical charges that destroy parts of the heart muscle that cause irregular heartbeats. The benefit brought by the robot is in its ability to automate large parts of the procedure, freeing surgeons to possibly perform multiple procedures simultaneously. It also means surgeons without the long training currently necessary to perform the common surgery can take charge. As St Mary's cardiologist, Dr. Wyn Davies says, "The attraction is the potential for automation - we can get details about the patient's heart anatomy from CT scans, then on the computer draw where you want the ablation delivered and hit return."